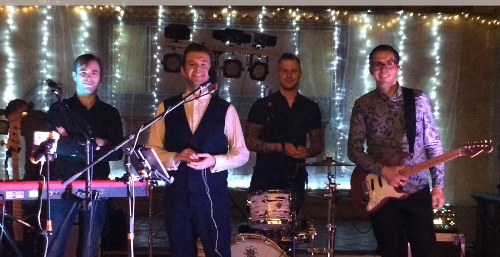 Another busy year for us for the number 1 Cheshire Wedding Band! And what a year it's been - we've been back up and down the country entertaining the masses and making memories from gorgeous walled gardens of mid-Wales to a nature reserve in the middle of a lake! We have traveled over 3000 miles and even hit the milestone of our 100th Wedding! So thank you to everyone who has booked us - we have loved every minute of performing for you. This one was very popular this year! Our favourite thing about this particular request is the amount of brilliant cover versions couples had chosen, from the likes of Pixie Lott, Daniel Duke and Sleeping At Last. It was so great for us to get to play such a well known anthem in so many different styles, not without closing with a few chorus' of the original of course. Our penultimate favourite has to go to palindromic pop legends ABBA. An entirely unique but brilliant choice to unsuspecting guests awaiting an intimate slow dance, an unforgettable first dance. If you want to start your night off with a bang, lets face it, this songs gonna get it going. Our favourite by a country mile. Points here for a meaningful short song that that we believe sums up the whole point of your big day in roughly a minute and a half. This is possibly the most original request we have ever had and we can't help but love the fact its from a hilarious movie about a wedding band! Helped by the stunning scenery of Lake Ullswater it put smiles on faces (including ours) and tears in eyes all around the room. Utterly superb choice, thank you!